Making axes, using axes and thinking about the different details of an axe never stops to fascinate. I make axes out of curiosity and love for the tool itself. Always keeping high standards and working without compromise is my inspiration. Now the first axe, a small carver, is here. I hope it will inspire you to make something with your own hands, and give you as much satisfaction as it gives me. 550 gram is easy to lift and the balance makes every gram work to your advantage. Our small carver is small but feels big. Carbon molybden steel and solid heat treatment makes the edge last longer. Our test shows remarkable difference. Developed with renowned carver Beth Moen. “It works excellent. Distinct feel, good balance and good for removing material”. 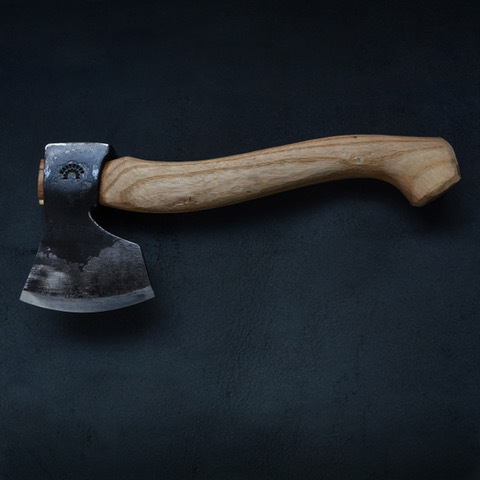 The small carver is a specialty axe and a precision tool. Useful when removing lots of material and fine cutting surfaces. It works well for beginner and senior carvers. It is developed in cooperation with renowned carver Beth Moen. The 550 gram axe head is easy to swing. The axe is balanced just below the axe head. This balance makes every gram work to your advantage, so when you need more power the axe feels larger. The edge comes ready to use and will hold a sharp edge for a long time. Hardened to 57 Rockwell, it has good edge retention and is still easy to sharpen. Knut Östgård: “I am very satisfied with it. The balance, weight, size, sharpness and handle length. I can easily carve with precise chops." Watch nestor spoon carver Knut Östgård carve a spoon with a Kalthoff axe. Good tutorial for beginners. Whetstone from Swedish shale, quarried and sawn in Loos in northern Hälsingland. Well known to make a sharp edge among Swedish craftsmen. It is useful when sharpening everything from your dear axe to knives, scissors or anything with an edge. A whetstone is a must for everyone that use edge tools. Learning how to sharpen your own tools gives greater self-confidence and understanding of how to use te tool. In addition, it gets safer and more pleasurable.